Designed by Porsche, the 485-hp Auto Union D-type was revolutionary in its day. Get invoice and market prices, specs, reviews and photos. Find cars for sale in your neighborhood. 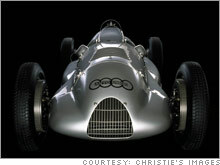 NEW YORK (CNNMoney.com) -- A rare 1939 German race car commissioned by Adolf Hitler is expected to command the highest price ever paid for any automobile at auction, according to Christie's, which will conduct the auction in Paris in February 2007. The car, one of five remaining "Auto Union D-Types," is expected to sell for as much as $12 million, said Rupert Banner, head of Christie's motor cars department. In 1933, after becoming chancellor of Germany, Hitler offered 500,000 reichmarks for a company to design a race car to show off the nation's technological prowess. Originally, Mercedes-Benz got the nod. But Ferdinand Porsche, then an engineer working with Auto Union, which today is known as Audi, was able to secure some of that financing to build a revolutionary car he had designed. That car was modified over the next few years to become the 1939 Auto Union D-Type. The D-type had a number of features that were extremely advanced for its day, including an engine mounted behind the driver and four-wheel independent suspension. Its twin-supercharged 3-liter V12 engine can produce 485 horsepower, giving the car a top speed of 185 miles per hour. In many ways, the D-type offered a glimpse into what would become the future of racing. It's fundamentally very similar to Formula 1 and Indy race cars of today. "It's the same as a modern day race car, just without fins," said Banner. D-type cars won several Grand Prix races throughout Europe. Two days after Germany invaded Poland, the same day that Great Britain declared war on Germany, the car Christie's will be auctioning won a Grand Prix race in Belgrade, Yugoslavia, Banner said. It was the last race held in Europe until after the war. "This was a legendary period in racing," Banner said of the prewar years. A number of D-type cars were lost or destroyed after World War II, according to Christie's. The car that will be sold in Paris was taken to Russia after the war, where it was disassembled to study its technology. The car was rediscovered in Ukraine in the late 1980s. It was still in pieces but was otherwise undamaged. Another car discovered nearby had had its chassis sawed in half, Banner said. The current record for a car sold at auction, according to Christie's, is £5.5 million, or almost $11 million. That was paid for a 1931 Bugatti Type 41 Royale Sports Coupe sold by Christie's in 1987. As for the connection to Hitler, "It's not something people really want to be associated with," Banner said. But the car's value rests on its technological importance, Banner said. Ian Kelleher, managing director of RM Auctions, a competing auction firm that specializes in classic cars, agreed that the Auto Union D-type is extremely valuable but felt that it might not go for as much as Christie's was expecting. The market for single-seat race cars is simply very limited, Kelleher said. "You can't drive the Auto Union anywhere but on a track, and it's a lonely way to spend $10 million," he said, referring to the low-end estimates of the car's value. The D-type will be sold as part of Christie's "Retromobile" auction of antique cars. Ferdinand Porsche also designed another car for Hitler but for a very different purpose. That car, inspired by the success of the inexpensive Ford Model T in the United States, ultimately became known as the Volkswagen Beetle. It also had a rear-mounted engine, as do today's Porsche sports cars. GM: The new green carmaker?